"OK Google" voice search is great - that is, until the device fails to understand you. 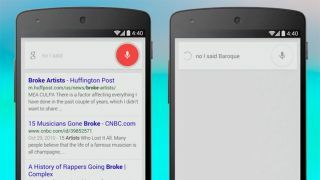 Thankfully, the search giant has built a failsafe into its mobile apps for just such occasions. Google has announced the latest Android and iOS versions of the official Google Search app are hiding a secret superpower allowing users to correct erroneous search queries. Announced with a brief video demo posted to Google+, the trick uses the voice command "No, I said," uttered right after a misheard verbal search. This will force the results to correct themselves, just like magic. For example, a search for "baroque artists" could easily be misinterpreted as "broke artists" with plenty of humorous results; immediately using the voice command "No, I said baroque" will theoretically clear up the misunderstanding and produce the desired search results. "If it ain't baroque, don't fix it. But if it is, you can tell Google … and it'll correct itself. Works on the Google app for iOS and Android," the cheeky Google+ post from July 8 read. Curiously, Google makes no mention of such a unique feature being added in the latest releases notes for the Google Search apps, beyond the usual "bug fixes and performance improvements" on Google Play. Making a voice-activated correction is certainly a better option than having to start over again with a new search query, and should lower the blood pressure of smartphone users too lazy to type out their missives via Google Search. The addition of "No, I said" also makes the voice-activated, Google Now-powered assistant that much more powerful - especially compared to Apple's Siri, which currently isn't very good at recovering when she doesn't understand what you're saying. Will the iPhone 6 save us all? Find out in our latest news roundup!